People invest so much on their choice of mattress, it’s understandable they would want to make it tastefully visual. They come to Flemington Decor to custom design all of their bedding, because our expertise and selection of materials is the best in the area. We can coordinate your bedding to any existing room color or style or we can design new window treatments to bring about a complete transformation. Bottom line: Flemington Decor will meet your style expectation, and make a good bedroom look great. Most commonly called a bed skirt or bed ruffle, it is a decorative piece of fabric placed between the mattress and box springs. It extends to the floor at the mattress’s sides and bottom. Its main function is to hide the box spring, but bed skirts also add a touch of softness, color, and decor to the room. 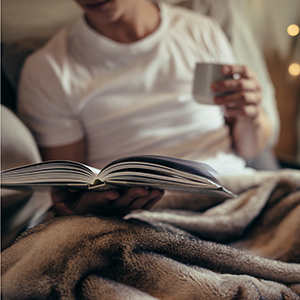 Smaller than a regular blanket, a throw, or toss blanket, is used to add extra warmth at the foot of the bed, or when wrapped around your shoulders. They are another good way to add a touch of color to your bed. A Euro or continental pillow—a large square pillow—is a decorative pillow that sits back against the headboard. The cover is removable for washing. A decorative pillow, also referred to as an accent or throw pillow, is a small pillow that comes in many shapes, sizes and colors to add decoration to a bed. A bolster pillow is a tubular pillow used for lumbar support while sitting up to read in bed, but more often, it’s used as a decorative pillow or accent pillow. These pillows range can be very small or can span the entire width of the bed. 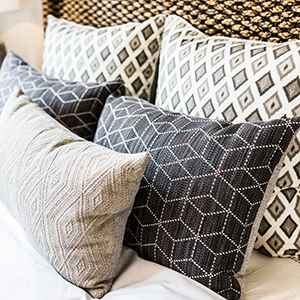 Pillow shams are decorative coverings for pillows, often designed with trims, ruffles, flanges, or cording. 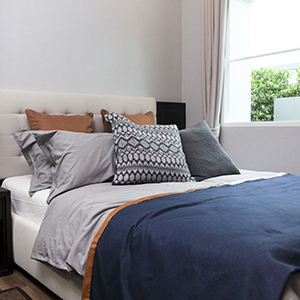 Add a couple of pillow shams to your bed for extra style. Show us a magazine, photo, or a fabric swatch of a bedding pattern or color that you admire, oir photo’s of your bedroom. We’ll research appropriate selections to mirror the look and feel of your submission. Let us share our experience in trends and curation to make your bedroom amazing.